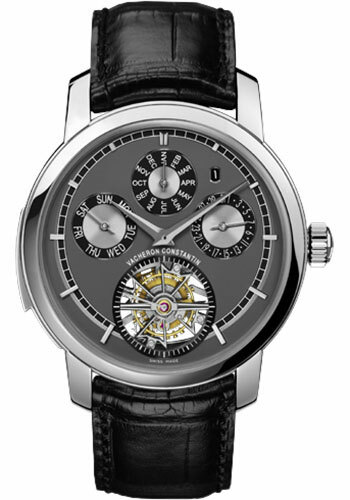 44mm platinum 950 case, transparent sapphire glass back, slate opaline dial with black painted minute track, manual-winding 2755 movement with hours, minutes, small second, small second on tourbillon, perpetual calendar (hand-type calendar, day of the week, month, leap year), minute repeater, and tourbillon, approximately 58 hours of power reserve, Mississippi alligator strap with diamond-set folding buckle. 44mm platinum 950 case, transparent sapphire glass back, silvered opaline dial with black painted minute track, manual-winding 2755 movement with hours, minutes, small second, small second on tourbillon, perpetual calendar (hand-type calendar, day of the week, month, leap year), minute repeater, and tourbillon, approximately 58 hours of power reserve, Mississippi alligator strap with diamond-set folding buckle. 44mm 18K 5N pink gold case, transparent sapphire crystal back, silvered opaline dial, manual winding 2755 movement with minute repeater, tourbillon, hours, minutes, seconds on tourbillon, perpetual calendar, power reserve on back, approximately 58 hours of power reserve, brown Mississipiensis alligator strap with 18K pink gold folding buckle. 44.00 mm 18K 5N pink gold case, 13.54 mm thick, transparent sapphire back, dark grey dial, Caliber 2755 QP manual-winding movement with hours, minutes, tourbillon, hand-type date, hand-type month, leap year, minute repeater, perpetual calendar, hand-type day of the week, small seconds on tourbillon carriage, power reserve on the back of the watch, approximately 58 hours of power reserve, black alligator Mississippiensis strap, 18K 5N pink gold deployant buckle. delivered with a magnifying glass and corrector pen, resonator of sound.